Key ingredients : Maida Flour , Ajwain , Edible oil Etc. No Preservative added in product . 100% pure ingredients. Slim Trim Mathri is a traditional north indian tea time snack. Slim Trim Mathri is great on its own with tea but traditionally they are served with mango or lemon pickle along with tea. This snack can also served as dahi papadi chat. It’s flavorful & crunchy snack and As it’s name it is very thin and small in shape and size . 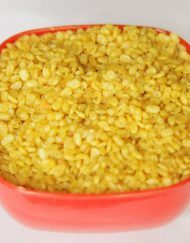 Mathris are usually served at weddings and poojas and made in almost every household on special occasions and festivals or entertaining guests. Conveniently pack portion controlled baggie’s to store your car, backpack, and desk with this delicious treat! Mathri’s are the perfect snack for anywhere, anytime. Enjoy this medium spicy slim trim mathri , We parcel it beautifully and gift to your near and dear ones. It is best tasted when consumed within the 30-50 days . If you order this slim mathri online now , Ratlami Tadka serve this at your door step between 2-5 days. Quickly order this online now and get your own packet of this munchy and crispy snack . “Slim trim mathri”.